We have guests coming to stay at our home in about 3 months. Which is technically the first time we’ve had overnight guests since we moved into this house. A year ago. I know, we are pop-u-lar. But let me tell you about a little problem. Our master bathroom shower is a joke. It’s so tiny, and so dingy, that we just shower in the guest bathroom. Oh, and there’s my handsome husband. 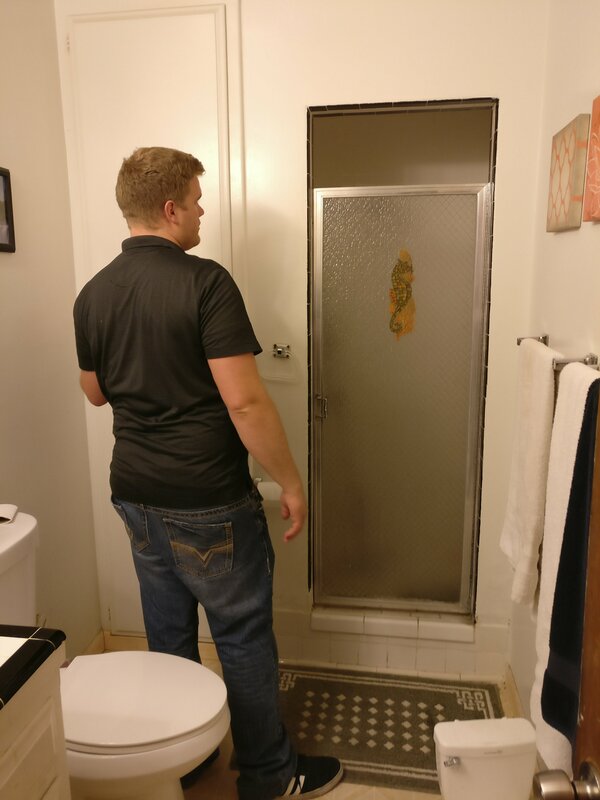 Who is 6 feet tall, and you can tell that he should not be showering in such a miniscule shower. He can barely fit through the door! Also, can we just all love the seahorse that really just won’t come off the shower door? Back to business. Us showering in the guest bathroom is a problem… if we have guests. Cause that’s like the whole house using one bathroom shower. So, last night the hubs and I (characteristically quickly) decided to use the impending arrival of guests as a motivation to take the time to remodel our master bathroom. We planned, we measured, we perused the Pinterest machine, we talked about necessary additions and we got really excited. And it’s unrealistic to finish it all in 3 months, with our current circumstances. But we can dream. – The space is used poorly for its size. – The shower is too small, badly lighted, and the inside gives the vibe of a dirty public pool shower. Not exactly the feel you want in your master. – The sink is too large for the bathroom, and inefficiently so; the space under the sink is pretty unusable and gross. – The mirrors and lighting are outdated. – There is a weird pipe in the side of the wall, and we don’t know what it does. It looks like a shower handle. – The storage cupboards to the left of the shower are insanely huge. They are useless, because they are far too deep, and difficult to clean and access. And how much stuff do you actually store in the bathroom anyway? – There is a vent fan, but it is (was) connected to when you turn on the light. Which is worse than no fan. – Luckily, we already replaced the master toilet at the end of last year, because it was even more of a joke than the shower. It wouldn’t even flush one square of toilet paper consistently, let alone weightier matters. So, on the bright side, that won’t be a cost in our remodel. 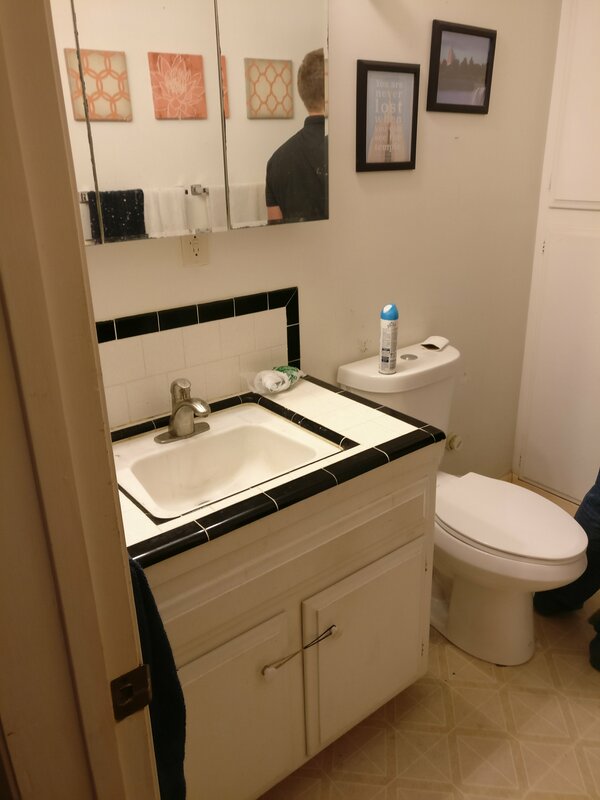 – Install a wall-mounted pedestal sink. Something with a liiiittle bit of counter space. This will open up the room while remaining functional. – Create some between-the-studs storage to the left of the sink. – Replace the 70’s flooring. – Expand the shower across and out. Elegant, bright, classy. Glass doors aren’t in the budget right now, but we are going to lay out the shower so that we can add them later. – Leave a little room for some cute vertical storage to the left of the shower. – Install open shelving above the toilet. – Replace the vent fan and reroute the wiring, to let the fan be turned on separately from the light. – Paint the walls, and add board and batten for a classy touch. Then we will be ready for guests. Haha. We’re obviously in way over our heads, but we are (temporarily) motivated! You’ve got to start somewhere, right?